Words of wisdom are pithy sayings that can be valuable so often that we believe them absolutely. Although these sayings are often valuable, they aren't universally valid. Here's Part IV of a growing collection. Benjamin Franklin portrait by Joseph Siffred Duplessis, ca. 1785. Benjamin Franklin wrote and published Poor Richard's Almanac from 1733 to 1758. The almanac contained numerous aphorisms, many of which survive today either intact or in sentiment. Examples include "There are no gains without pains" (No pain, no gain); "If you would have your business done, go; if not, send" (If you want something done right, do it yourself); and "The rotten apple spoils his companion" (One rotten apple spoils the barrel). These three aphorisms are still used in the organizational context in their modern forms. They are all true to an extent, but like the sayings listed in this essay, they aren't universally true, and they are widely misapplied. 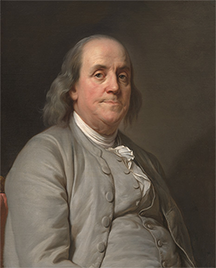 Photo of a painting of Benjamin Franklin by Joseph Siffred Duplessis held at the U.S National Portrait Gallery of the Smithsonian Institution. Some of what's widely believed about managing people is often right. But some is worse than worthless. We're actually better off ignoring it. Here's a fourth installment of adages and beliefs that sound like common sense, but which are actually untrue or massively misapplied. See "Wacky Words of Wisdom," Point Lookout for July 14, 2010, for Part I and links to others. Many believe that for any given individual, and any desired behavior, we can structure money-based incentives that effectively elicit the behavior. That is a false belief. Numerous studies have demonstrated the falsity of this belief [Kamenica 2012]. Even if such an incentive program did exist, it could be effective only with accurate communication of the program to the target individuals. And we all know how unreliable communication can be. This belief is the inverse of the monetary incentives idea. It holds that disincentives can deter employees from any specific undesirable behavior. It's also a false belief. Although disincentives can deter some people from some behaviors, we overestimate the effectiveness of disincentives, and we often overlook their negative side effects. Research has demonstrated [Eschleman 2014] the shortcomings of disincentives. Moreover, the effectiveness of disincentives in deterring others is limited by communications constraints arising from regulations designed to protect the privacy of individuals who have been disciplined or terminated. This belief is at the heart of claims that incentives and disincentives are effective. The effectiveness of incentives and disincentives depends on people making rational choices after being informed of them. In 2002, Daniel Kahneman, an Israeli-American psychologist, was awarded the Nobel Prize in economics for foundational work he carried out jointly with Amos Tversky, who was deceased at the time of the award (the Prize is not awarded posthumously). Kahneman and Tversky demonstrated that people don't always choose rationally; indeed, in some classes of situations, they rarely choose rationally. Among other mechanisms, cognitive biases account for many of these phenomena. better off ignoring it.size scale, enterprises have reorganized themselves around teams. Teams are effective for some things, but not everything, and not in every setting [Bacal 2015]. Probably the next level of sophistication about teamwork will involve knowing when not to organize as teams. Writing is an example. If documents can be segmented, then teams (actually groups of individuals) can write them faster and better. But when we need consistency of style and content, single authors do best. And so it is with much else that people are now trying to do in teams. Study the work you do as teams and ask "How is (or maybe, 'Is') the team structure helping?" For more examples, see "Wacky Words of Wisdom," Point Lookout for July 14, 2010, "Wacky Words of Wisdom: II," Point Lookout for June 6, 2012, "Wacky Words of Wisdom: III," Point Lookout for July 11, 2012, "Wacky Words of Wisdom: V," Point Lookout for May 25, 2016, and "Wacky Words of Wisdom: VI," Point Lookout for November 28, 2018. Would you like to see your comments posted here? rbrenfUtrUfGupRvzONvfner@ChacMBTxEBkLGOjJRzpVoCanyon.comSend me your comments by email, or by Web form. In much of the world, the handshake is a customary business greeting. It seems so simple, but its nuances can send signals we don't intend. Here are some of the details of handshakes in the USA. As people, we're very good at forming and holding beliefs and opinions despite nagging doubts. These doubts lead us to search for confirmation of our beliefs, and to reject information that might conflict with our beliefs. Often, this process causes us to persist in believing nonsense. How can we tell when this is happening? I offer email and telephone coaching at both corporate and individual rates. Contact Rick for details at rbrenezFgBrlGZcvPqSRqner@ChacRosuHtVOGJpUwesjoCanyon.com or (650) 787-6475, or toll-free in the continental US at (866) 378-5470.